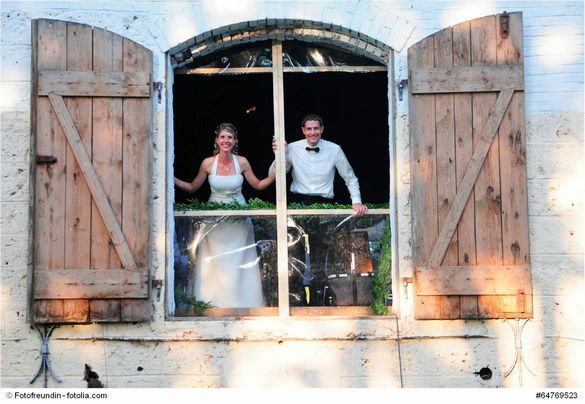 Barn weddings lend a certain rustic charm to the entire event and are a great idea if you want an intimate affair with your close family and friends. Since a barn is a large, wide and open space, it can easily be converted into a wedding venue of your dreams. The decorations and arrangements can be done entirely based on your budget. If you want a Western theme for your wedding, then there is very little that you have to do here but if you are looking for a more formal wedding, then you will need to cover up the area accordingly. The best and simplest way to convert a barn into a wedding venue is by covering the walls with fabric like organza, tulle or simple paint drop cloths. Choose the color which best matches the theme of your wedding. If you want a very regal and formal look, a combination of white and gold will be great. Pinks are also a favorite with most brides and add a soft touch to the décor. Draping fabric is also the best way by which you can cover up any area like columns etc. Lights are a must for all barn weddings and this is another way by which you can get creative and decorate the space. You can either rent grand chandeliers for a ballroom effect or hang up LED lights or paper lanterns for a cozier and intimate gathering. Candles on the tables are also a great way to add warmth to the occasion and light up the entire room. The other way by which you can liven up the space is by flower arrangements both on the tables and also across the room for a fresh and dewy look. You can either go in for fresh flowers or use dried flowers for a more rustic feel to the room. Make seating arrangements according to the size of the barn. If you want to create a dance floor, then arrange the tables and chairs around the room leaving the central space vacant. The music system or the band can be provided space at one end of the room and speakers placed at the other end to make sure that the music is audible to all guests. Another important aspect of all barn weddings is the food. Get a catering agency to bring in food at the required time. You may have to arrange an area at the back of the barn if any last minute cooking process is involved.